The Teck Celebrity Pie Throw is an annual Mining for Miracles fundraising event in support of BC Children’s Hospital Foundation. The 2018 Pie Throw will take place on Thursday May 24, 2018 at the Vancouver Art Gallery. 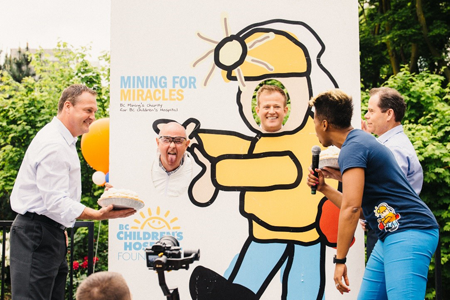 During Pie Throw, participants toss the world’s most expensive cream pies in the faces of mining industry leaders, all in support of BC’s sick and injured children. One hundred per cent of all funds raised as part of the Pie Throw will go to support the development of the Transplantation & Cell Therapy Program (TRACE), the first of its kind in Canada. In 2017 and 2018, Mining for Miracles will raise approximately $2.9 million to support the development of TRACE. TRACE will work towards providing children across British Columbia with personalized medicine using the patient’s own cells to prevent rejection of organ transplants, kill cancer cells and fight infection. Learn more at www.miningformiracles.ca. If you would like to make a gift in support of a Pie Throw participant, please select the participants name from the "Pie-ees" list below.